by Sean Hackbarth, Free Enterprise: The cover of this week’s Economist is a topic that’s tackled almost daily here: the over-regulation of America. Rule after rule after rule, mostly all well-meaning, grips the economy, squeezing out its vitality. At 848 pages, it is 23 times longer than Glass-Steagall, the reform that followed the Wall Street crash of 1929. Worse, every other page demands that regulators fill in further detail. Some of these clarifications are hundreds of pages long. Just one bit, the “Volcker rule”, which aims to curb risky proprietary trading by banks, includes 383 questions that break down into 1,420 subquestions. Next year the number of federally mandated categories of illness and injury for which hospitals may claim reimbursement will rise from 18,000 to 140,000. There are nine codes relating to injuries caused by parrots, and three relating to burns from flaming water-skis. While the regulatory pile-on is bipartisan, this chart from the Jobs Creators Alliance shows the number of “economically significant rules” has gone up more steeply in the last few years under the current administration. The White House concedes their new rules have cost businesses $25 billion, more than double the costs from the two previous administrations. The complexity of all these rules squeezes the air out of the economy. For example, the Economist notes that the Sarbanes-Oxley financial law caused America’s share of initial public offerings (IPOs) to drop from 67% to 16%. In addition, more rules prevent businesses from investing in projects, growing, and hiring workers. Then Gallup found almost half of small businesses say government regulations are keeping them from hiring. And we’re surprised unemployment is as high as it is? A step toward a solution is also bipartisan, the Regulatory Accountability Act, sponsored by Sens. Rob Portman (R-OH), Mark Pryor (D-AR), and Susan Collins (R-ME). It would require agencies to weigh the costs and benefits of proposed rules, add more transparency and public input to the rulemaking process, and ensure agencies use sound scientific and technical data in their analysis. 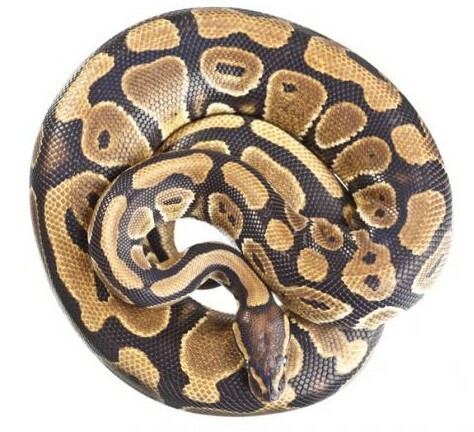 It’s a way to uncoil the regulatory python around the American economy, allowing it to spring free to create jobs and prosperity. ARRA News Service Editorial Note: In sharing the excellent article by Mr. Hackbarth, we are not endorsing actions of the Senators mentioned. It is seldom that we offer or share anything positive about Arkansas Senator Mark Pryor. The reasons are obvious. This site is conservative and he is not. However, it surprised me that he co-sponsored the "Regulatory Accountability Act." We will wait (not holding our breath), to see if this Act develops into a meaningful restraint on government regulations. After all, this is the same Mark Pryor who supported the Federal health Care law which has been one of the biggest takeovers of American business and biggest attacks on individual rights and personal liberty through regulations. So for now, Sen. Pryor, we are indeed watching your words and actions. Tags: Sean Hackbarth, Free Enterprise, U.S. Chamber of Commerce, Dodd-Frank law, 2010 health care law, regulatory python, regulations, rules, final rules, the economy, business, industry To share or post to your site, click on "Post Link". Please mention / link to the ARRA News Service. Thanks! Bill Smith, Editor, NFRA and ARRA Member: I have been asked if the Republican Party cares about or knows about UN's Agenda 21 and its impact on the property and personal rights of American citizens. My answer has been yes. However, until the Republican National Committee publicly acknowledged the existence of Agenda 21 and the issues, it has been difficult to convince those who asked the question that the RNC is concerned. The RNC has done so now. Tags: 2011 NFRA Presidential Preference Convention, NFRA, National Federation Republican Assembly, Agenda 21, Liberty, Property, Republican National Committee, RNC, United Nations To share or post to your site, click on "Post Link". Please mention / link to the ARRA News Service. Thanks! After three year, it is extremely obvious to democrats (barring liberal progressives), republicans, and independents that President Obama 2009 Stimulus has been an abject failure. All we have to do is look at our neighbors, friends and family and our economy. Question: Barring President Obama and his friends and family, Are Americans better off today that when the Barack Obama signed his 2009 Stimulus bill? For the majority, the answer is NO. If readers need source information beyond which has been provided over the last few days, below are more links. Tags: Barack Obama, Obama Administration, 3 years, stimulus, failed, Editorial Criticism, Investment To share or post to your site, click on "Post Link". Please mention / link to the ARRA News Service. Thanks! - House: Yes vote: 146 House Republicans and 147 Democrats; No vote: 91 Republicans and 41 Democrats. -Senate: Yes vote: 45 Democrats, 1 independent and 14 Republicans; No vote: 30 Republicans, 5 Democrats and 1 independent. 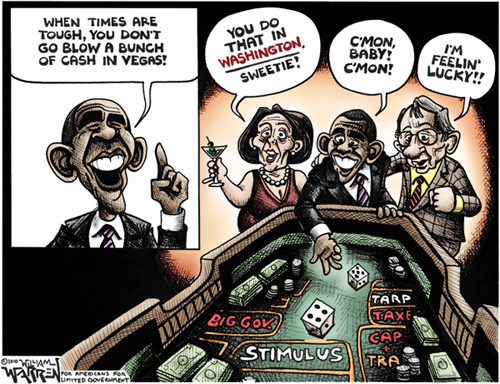 "Obama: The Real Gambling Man"
Votes on payroll tax extension likely today. The House and Senate leaders prepared for final votes Friday for a #150 billion economic package. Senate resumed consideration of S. 1813, the highway bill. If cloture is not invoked then they will vote on the nomination of Jesse Furman for US District Judge, Southern District of New York. Then the Senate will vote on conference report extending the payroll tax cut, H.R. 3630. Indeed, it’s quite instructive to look at the “highlights” of the nearly $1 trillion stimulus passed by the Democrat Congress at the urging of President Obama. Three years after Obama promised, “It's a plan that will save or create up to 4 million jobs over the next two years” and Senate Majority Leader Harry Reid (D-NV) boasted, “This bill creates 3.5 million jobs,” there are 5 million fewer workers employed in the United States than White House economists Christina Romer and Jared Bernstein predicted. Almost half a million jobs have been lost since the day Obama signed the bill. 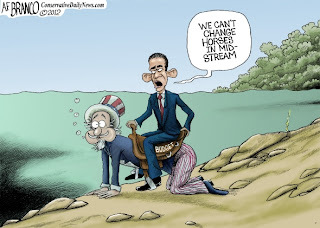 As Senate Republican Leader Mitch McConnell said in his speech at CPAC 2012 last week, “Three years ago this month President Obama signed a trillion dollar Stimulus bill that we were told would keep unemployment below 8 percent and drop-kick us out of the recession. Tags: Washington, DC, US Senate, US House, stimulus bill, results, failures, payroll tax cut, doc fix, unemployment benefits To share or post to your site, click on "Post Link". Please mention / link to the ARRA News Service. Thanks! Washington - Today it is exactly 3 years since President Obama signed his infamous stimulus package into law. It was a plan designed to create jobs by growing the size of government, and its record has not been good. Democrats said their costly plan ($1.2 trillion, including interest) would “save or create” up to 4 million jobs and bring the unemployment rate down to about 6% today. The unemployment rate has not fallen below 8% at any point in the last 36 months. Furthermore, the official unemployment rate does not actually count unemployed people who have given up looking for work. The above chart shows the “labor force participation rate.” This statistic represents the share of working-age Americans who are either employed or unemployed but looking for work. It is not a pretty picture. Only 63.7% of working-age Americans are currently in the workforce – the lowest in almost 29 years! To put it another way, 36.3% of working-age Americans do not have a job and are not even looking. After 3 years of failure, it’s time to try something that will work. Let’s ramp up energy production. Let’s cut away government red tape that slows down job creation. And let’s design new tax code that is simpler, flatter, and fairer. Let’s pass the Jobs Through Growth Act, and create jobs by growing the economy – not the government. Tags: Barack Obama, Obama, Stimulus Plan, three years ago, where are the jobs, To share or post to your site, click on "Post Link". Please mention / link to the ARRA News Service. Thanks! Jobs Bills: What’s The Holdup? · Companion measure S.1544 sponsored by Sen. Pat Toomey (R-PA). Cosponsored by Sen. Richard Blumenthal (D-CT), Sen. Claire McCaskill (D-MO), Sen. Robert Menendez (D-NJ), Sen. Jon Tester (D-MT). · Changes SEC rules to allow companies to sell up to $50 million in shares without filing lengthy paperwork. · Companion measure S. 1941 sponsored by Sen. Kay Bailey Hutchison (R-TX). Cosponsored by Sen. Claire McCaskill (D-MO), Sen. Bill Nelson (D-FL), Sen. Mark Pryor (D-AR). · Increases the number of shareholders permitted to invest in a community bank from 500 to 2,000. · Companion measure S.1831 sponsored by Sen. John Thune (R-SD). · Eliminates an SEC regulation that inhibits companies from reaching out to potential investors in order to raise capital. · Companion measure S.1791 sponsored by Sen. Scott Brown (R-MA). · Changes SEC regulations that inhibit entrepreneurs from raising capital among large groups of small dollar investors. Tags: Obama Administration, White House, Senate, jobs bill, Small Company Capital Formation, Shareholder Registration Thresholds, Access To Capital For Job Creators, Democratizing Access To Capital To share or post to your site, click on "Post Link". Please mention / link to the ARRA News Service. Thanks! By Ken Blackwell, Contributing Author: Early in his administration, President Obama, pledged to cut the federal deficit in half. 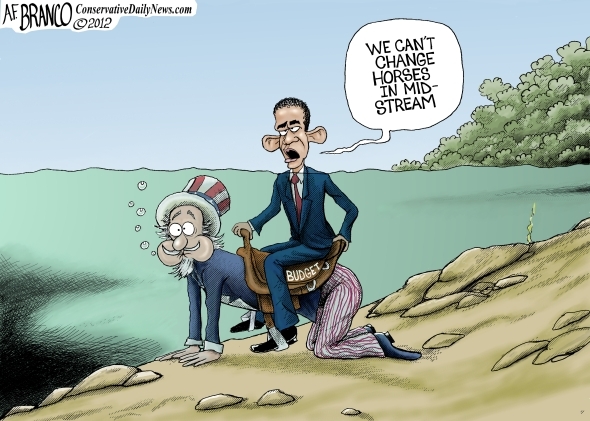 But his recent budget proposal, to say Obama has not kept his promise is an understatement. 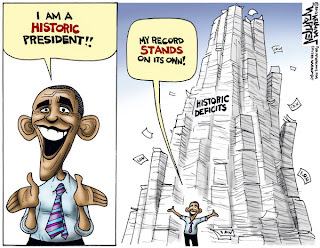 Determined to keep Americans drowning in debt, Obama proposes to accelerate federal spending $3.8 trillion in 2013 to $5.8 trillion in 2022, a whopping increase of 53 percent. By spending more than $45 trillion in the next 10 years, the most generous accounting would assume $6.7 trillion would be added to the federal deficit, bringing debt-to-GDP ratio who a crushing 76.5 percent. The slow ending of the Afghanistan war gave the Obama Administration room for an $800 billion Washington-style accounting gimmick, where borrowed money that would not have been used is counted as saved. In terms of actual cuts in defense spending, Obama is shifting the focus from what is known to work in missile defense to developing futuristic missile intercepts which will require years of experimenting at great expense to taxpayers while a vulnerable America waits. It has become obvious that America faces increasing nuclear threats from hostile regimes like Iran and North Korea. In June, Iran announced it was planning to triple its capacity to produce 20 percent enriched uranium, which can easily be converted to weapons-grade material. This week, Iranian President Ahmadinejad plans a major announcement for Iran’s advancement in its atomic program, a move to show how increased U.N. sanctions have failed to halt Iran’s technical progress. Our first line of defense against short and intermediate-range airborne attacks is the Standard Missile 3 (SM-3), which can intercept enemy missiles while in flight. Their proven track record is why they are also essential to the NATO effort in Europe to defend against missiles from hostile nations. consistently complained about shortages. The President’s $300 million reduction may also slow production, which could make the new missile delivery date of 2015 very difficult to meet. The timing couldn’t be worse considering U.S. Defense Secretary Leon Panetta predicted last month that Iran would be capable of launching a nuclear missile at the U.S. as soon as 2014. But President Obama’s short-sightedness doesn't end there. At the same time the President chopped funding for the first missile that will be able to protect us against an ICBM attack, he chose to pour $224 million into a sophisticated and tedious missile program that is on life support. Apparently, President Obama did not receive that message from Congress. After spending millions on development, Obama has unilaterally decided to shift resources toward more complex future missile variants—a process notorious for being obscenely over budget and off schedule—while rejecting the Congress’ more sensible approach to fiscal responsibility and a more robust national defense. President Obama’s decisions on missile defense will create a multiple-year window where a country such as Iran could strike before our new SM-3s are in place. By reversing course, not only would taxpayer dollars be used more effectively, America will be properly protected from enemies well into the future. J. Ken Blackwell is aa fomer Ohio Treasurer and Secretary of State. He is the co-author of the new bestseller: The Blueprint: Obama’s Plan to Subvert the Constitution and Build an Imperial Presidency. He is a member of the Board of Directors of the Club for Growth and of the National Federation of Republican Assemblies He is a contributing author to the ARRA News Service. Tags: Ken Blackwell, Barack Obama, budget, budget bomb, accounting gimmick, spending increases, Disarming America, unilateral reductions, cutting military programs, threats, Iran, North Korea To share or post to your site, click on "Post Link". Please mention / link to the ARRA News Service. Thanks! Gary Bauer, Contributing Author: Dr. Scott Gottlieb, a former deputy commissioner of the Food and Drug Administration and senior policy adviser to the Centers of Medicare and Medicaid Services, has a very illuminating column in today's Wall Street Journal. The column sheds new light on Obama's contraception mandate and argues that ObamaCare will lead to higher health care costs, rationing and premature deaths. In their wisdom, the liberal Democrats who wrote the ObamaCare legislation dramatically expanded the authority of United States Preventive Services Task Force. That might sound like some shadowy outfit from a B movie, but the members of this task force might be better known as ObamaCare's mandate makers. Dr. Gottlieb writes that it is the job of this task force to "evaluate preventive health services and decide which will be covered by health-insurance plans." The committee will mandate some medical tests and treatments while refusing to cover others. "Health plans will inevitably choose to drop coverage for many services that don't get a passing grade from the task force and therefore aren't mandated. Insurance companies will need to conserve their premium money, which the government regulates, in order to spend it subsidizing those services that the task force requires them to cover in full." Prior to ObamaCare, your insurance company determined the cost of your premiums based on your health factors and the level of service you wanted. If your rates went up, you had the freedom to find another company. But now, thanks to ObamaCare, your premiums will be decided by Big Government, which is adding more and more mandates, and there will be very little competition in the price as a result of all the mandates that every insurer will be required to cover. By the way, the task force is not subject to any of the other rules and procedures that govern similar federal agencies. There are no requirements for it to hold public meetings or to consider public comments, there is no process to appeal its decisions and it cannot be sued. How's that for big government? Tags: Gary Bauer, Campaign for Working Families, health care rationing, Obamacare, To share or post to your site, click on "Post Link". Please mention / link to the ARRA News Service. Thanks! Senate resumed consideration of S. 1813, the highway bill. Many amendments have been filed for the highway bill, but there is no agreement on how to work through them yet. Yesterday, Senate Majority Leader Harry Reid (D-NV) offered his own amendment and then filed for cloture on it. He also filed for cloture on a district judge nomination that would be voted on if cloture fails on his highway bill amendment. Currently the cloture vote on the Reid amendment is scheduled for Friday morning. Yesterday, the Senate voted 94-5 to confirm Adalberto Jose Jordan as a judge for the Eleventh Circuit. Yet three years later, the unemployment rate has been higher than 8% for 36 months. The average duration of unemployment was 40.1 weeks as of January. 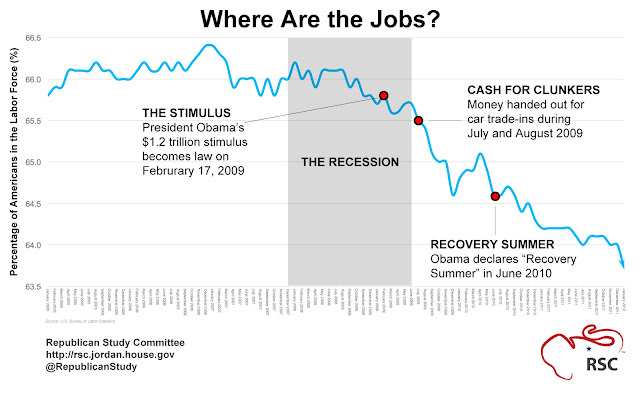 Over half a million jobs have been lost since the stimulus was signed, and millions have been lost since the recession began. Clearly the stimulus did not live up to the Obama administration’s promises. Tags: Washington, D.C., anniversary. Obama stimulus, fewer jobs, more debt, wasted government investments, Solindra, To share or post to your site, click on "Post Link". Please mention / link to the ARRA News Service. Thanks! Tony's Cartoon is based on the story this week of a 4-year-old North Carolina girl who had her home-packed lunch deemed unsuitable by a food inspector at her school, West Hoke Elementary School. The inspector said her turkey sandwich wasn’t healthy enough and gave her a school lunch instead which consisted of chicken nuggets! For more info and an interesting post is on Human Events: Attack of the lunch police: Give me a turkey sandwich, or give me death. 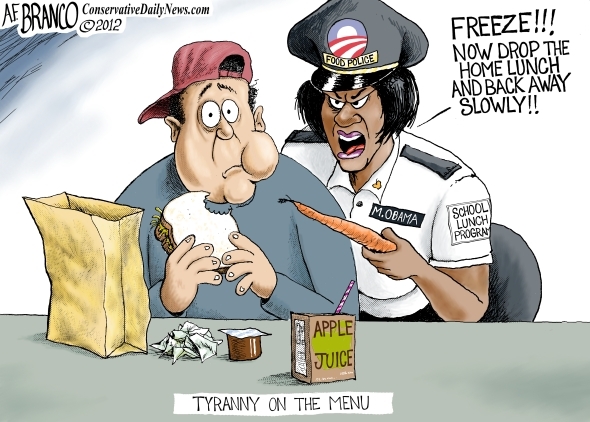 Tags: food police, handouts, Michelle Obama, Public Education, Public Employees, public sector unions, School Lunch, government abuse, AF Branco, political cartoon To share or post to your site, click on "Post Link". Please mention / link to the ARRA News Service. Thanks! by Phyllis Schlafly, Eagle Forum: Proclaiming in a New York Times headline that "Obama Adjusts a Rule Covering Contraceptives," the pro-Obama media tried to dig the President out of the political hole he had jumped into. But calling Obama's revised rule an "adjustment" or an "accommodation" or other soft-sell word can't cover the fact that the revision is essentially the same as the original rule. A big New York Times editorial cried out that Obama's action means "The Freedom to Choose Birth Control." Poppycock. Every American already has the right to choose birth control, but that shouldn't give them the right to have somebody else pay for it, and that's what ObamaCare demands. The bottom line is that the ObamaCare insurance, which employers are mandated to provide and individuals are mandated to buy, will include birth control, the morning-after pill (an abortion drug), and sterilization, at zero cost to the individual without any additional premium, co-pay, or out-of-pocket expense. And yes, this mandate does apply to religious hospitals, schools, colleges, and charities, even though their religion teaches them that these acts are immoral and wrong. Obama's original rule called for religiously affiliated institutions to pay for these controversial services, which even liberal commentators denounced as a gross interference with religious liberty. It was even denounced by Chris Matthews, E.J. Dionne and Democratic Senators, and the ever-loquacious Joe Biden hid out in uncharacteristic silence. After the firestorm erupted, Obama may have thought he could get the Catholic Bishops to go along with his accommodation (as a couple of liberal nuns did), but the Bishops saw through his duplicity. The U.S. Conference of Catholic Bishops pointed out that the "adjustment" still includes a "nationwide mandate of insurance coverage of sterilization and contraception, including some abortifacients" and also that the many "self-insuring religious employers, and religious insurance companies, are not exempt from this mandate." The accommodation orders insurance companies to pay the costs of these birth control/abortion services, but you can be sure insurance companies will price their products to make a profit. It's obvious that insurance companies will distribute and conceal the costs so nobody appears to be paying for the controversial procedures. Since the insurance companies will not be permitted to charge different fees for different employees, all their customers will be paying something for the controversial services. In plain words, all religiously affiliated institutions and their employees will be paying for birth control/abortion drugs, but not "explicitly," as the Wall Street Journal delicately explained. Congressman Chris Smith (R-NJ) summed up this issue: "The White House Fact Sheet is riddled with doublespeak and contradiction. It states, for example, that religious employers 'will not' have to pay for abortion pills, sterilization and contraception, but their 'insurance companies' will. Who pays for the insurance policy? The religious employer." The political donnybrook continues as many people are speaking out against Obama's rule, both the original and the revised version, because it is an outrageous interference with religious liberty. How dare Barack Obama and HHS Secretary Kathleen Sebelius tell religiously affiliated institutions that they must do something that violates their moral code? One of the shocking parts of this charade is the fact that the U.S. Army Chief of Chaplains sent an email to senior chaplains telling them that Archbishop Timothy Broglio's letter criticizing the Obama rule was not to be read from the pulpit. Has anti-religious bigotry become so extreme, even in the military, that a chaplain's sermon is expected to be banned or censored to conform to Obama's prejudices? Lesson #1: this issue demonstrates that the Obama Administration is participating full-strength in the ongoing campaign against religious liberty. Lesson #2: this issue demonstrates that national health care involves so much more than health, and that all decisions, major and minor, will be controlled by federal bureaucrats, not by patients, not by doctors, not by taxpayers, and not by any elected representatives, state or federal. As Walter Cronkite used to say, "That's the way it is." 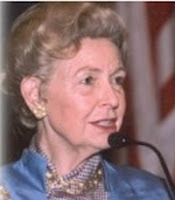 Tags: Phyllis Schlafly, Eagle Forum, Barack Obama, Feminists, national health care, federal bureaucrats, government control, sterilization, contraception, abortifacients, birth control, Catholic Bishops, insurance companies, religious liberty To share or post to your site, click on "Post Link". Please mention / link to the ARRA News Service. Thanks! Too bad that, in 2008 and before, so many of these lately roused Christians lost sight of the example of America's founding generation. It would have instructed them to "take alarm at the first experiment on our liberties," reacting against Obama's proven commitment to evil principle before "usurped power had strengthened itself by exercise." Of course such precautionary discernment requires the ability to think and act in terms of principle (i.e., the first beginnings of action). With his characteristically practical wisdom, Christ admonishes us to understand that evil comes "out of the heart" (Matthew 15:19). It originates (as the Creator observes in Genesis 6:5 and 8:21) in the intentions of the heart, which are made manifest in the characteristic thoughts and ideas that reflect the workings of the mind. With respect to the fundamental issues of moral right, Barack Obama's rejection of the most fundamental "laws of nature and of nature's God" has been clear throughout his career, especially in his adamantine commitment to the murder of human posterity, before and after birth. This is why it was a moral atrocity for a university claiming to educate in the tradition of Catholic Christianity to honor Obama after his election. This is why it is morally irrational for professing Christians to support creation of a health-care delivery system dominated by an administration of government scrupulously cleansed of every acknowledgement of the existence and authority of the Creator. This is the essence of that slavery, which the Obama faction now means to impose. ... Because some people wish to do and benefit from evil, others must become its tools and instruments, against their will. Because some wish to escape responsibility for the nascent life invoked by their cries of sexual ecstasy, others must accept complicity in the murders that carry out their will. At the very least the people who embrace this foul cult of human child sacrifice should have to do the dirty work themselves. But when has evil been content to wallow in its own excrement? The very pride that impels it to defy the boundaries of decent conscience rouses its resentment against those who, by standing apart from its rituals, announce their condemnation of its crimes. As it was with slavery, so it is now. Evil does not accept a house divided, but will "press forward" until "It will become all one thing, or all the other." Abraham Lincoln said it, and he was right. He spoke of the crisis of slavery that brought on the Civil War. Now we have come to a similar crisis, one that will determine whether American government will be a union of conscientious souls determined to do right, or become instead a league of wicked intentions determined by force and tyranny to impose the ruling passion of the day though all and every God-established right be ruined in the process. Tags: Alan Keyes, era of persecution, Barack Obama, rejection, laws of nature, nature's God, rights of conscience, crisis of slavery To share or post to your site, click on "Post Link". Please mention / link to the ARRA News Service. Thanks! Arlington, VA – A new poll sponsored by Public Notice and conducted by The Tarrance Group, reveals that the majority of voters want to see President Obama’s budget cut spending and lower taxes, while few expect it will materialize. 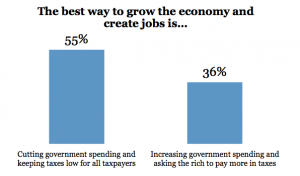 When asked about the best way to grow the economy and create jobs, voters respond with a strong preference for cutting government spending and keeping taxes low (55%) as opposed to increasing government spending and asking the rich to pay more in taxes (36%). - Americans believe the economy and overspending are connected. Fully 73 percent believe the economy is extremely or very impacted by the national debt. - Americans want to solve the nation’s fiscal and economic problems by cutting spending. 55% of voters say the best way to get the economy moving again and create jobs is to cut government spending and keep taxes low. Only 36% think the best way to improve the economy is to increase spending. - However, Americans are pessimistic Washington will cut spending. 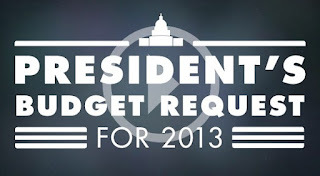 While 75% want President Obama to cut spending in his fiscal year 2013 budget, only 31% think he will. - Perhaps that’s because Congress has failed to even pass a budget in the last few years. 84 percent of voters find it extremely or very concerning that the U.S. Senate has not passed a budget in the last three years. View the complete poll. It was conducted February 6-8, 2012 and the results noted above are from 800 registered “likely” voters across the country. In 95 out of 100 cases, the confidence interval associated with a sample of this type is +/- 3.5%. To interview Gretchen Hamel on the findings of this poll, contact Public Notice Public Notice is an independent, non-partisan, non-profit, 501(c)(4) organization dedicated to providing the facts and insights on the effects public policy has on Americans’ financial well being. Tags: Public Notice, poll, spending cuts, low taxes, budget, deficit, overspending, poll, spending cut, taxes To share or post to your site, click on "Post Link". Please mention / link to the ARRA News Service. Thanks! LA Times: Obama's Budget "No Real Solutions" - Chicago Tribune: Plan Would "Grow Our Debt By Leaps And Bounds"
The President’s Budget in 62 Sec. At noon, the Senate will vote on the nomination of Adalberto Jose Jordan to be United States Circuit Judge for the Eleventh Circuit. Following the vote, the Senate will return to consideration of S. 1813, the highway bill. Votes on amendments to the bill are possible today. The House today will consider H.Resolution 547 addressing several bills including H.R. 3408 to set clear rules for the development of United States oil shale resources, to promote shale technology research and development, and for other purposes; H.R. 3813 to amend title 5, United States Code, to secure the annuities of Federal civilian employees, and for other purposes; and H.R. 7 to authorize funds for Federal-aid highway, public transportation, and highway and motor carrier safety programs, and for other purposes. In addition the House and Senate conferees are attempting to negotiate another payroll tax break for the remainder of the fiscal year. Tags: US Senate, Us House, Obama Administration, Budget Plan, newspaper reports, no real solutions, more debt, video To share or post to your site, click on "Post Link". Please mention / link to the ARRA News Service. Thanks!